Situated on the southeast coast of the Tasman Sea, Sydney is the most popular city in Australia. It is also the largest and most populous city in Australia with several beautiful beaches, historic landmarks, iconic buildings, lovely hotel accommodations, incredible restaurants, vibrant night life and above all a unique culture that draws hordes of tourists and business travelers from all over the world. Sydney, a beautiful city and a dream destination for every tourist, is filled with a lot of stunning fascinations. Whether you are planning a memorable holiday with loved ones, looking for an adventurous or relaxing holiday or simply want to enjoy the most remarkable honeymoon, then you should book cheap flights to Sydney for an unforgettable experience. Sydney is home to Kingsford-Smith Airport, one of the well-equipped airports in the world. Located 8 km south of the city centre, the Kingsford-Smith Airport, also known as Sydney airport, is an international airport and the major airport serving the beautiful city of Sydney, Australia. Major airlines serving Sydney Airport include Jetstar Airways, Virgin Australia, and Qantas. There airport has 3 runways to serve its clients and is considered the world’s oldest continuously operated airport. Used by over 40 million passengers flying in and out of the city, the airport is the busiest of all the airports in Australia and among the top 30 busiest airports in the world. Managed by Sydney Airport Corporation Limited (SACL), Sydney Airport offers flight to over 40 domestic destinations and international destinations. From the airport, travelers can easily get to the Sydney town center via the bus, rail or taxi. With the taxi, you will get to the city center in about 20 minutes, while the bus will get you there in around 30 minutes. The train is the fastest means of transportation to the city center with about 13 minute travel time. If you are looking for a more convenient means of transportation, you can decide on renting a car from major international car hire companies such as Budget, Thrifty, Avis, Hertz, Europcar, and Red spot. You can easily make reservations for the car that best suit your needs via their website and by booking ahead of time. By so doing, you will get a discounted rate for them. Search for cheap airline tickets to Australia. Sydney is a comfortable place to travel any time of the year. For a lot of travelers, the best time to visit Sydney is during the spring which covers the months from September to November. The weather is exceptionally pleasant and perfect for a lot of fun-filled activities. This is the best time to enjoy surfing, swimming and windsurfing on the Sydney beaches, cruise on harbour and visit several lovely attractions including Sydney Opera House, Hyde Park, Darling Harbour, the Royal Botanical Garden and much more. Check cheap flights to Sydney. Sydney is a wonderful travel destination that has something for all ages. There are plenty of things to do and see in Sydney regardless of the seasons. From enjoying wildlife to swimming, from horse riding to bowling, from camping to cruise tours, Sydney is a place to enjoy memorable moments. 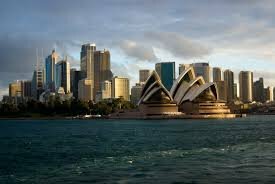 The cheapest international flights to Sydney(AU) are on Mobissimo, the free travel search engine. In addition to cheap international flights to Sydney(AU), we help you find the best rates to both major and boutique hotels in Sydney(AU). Consider flexible travel dates when looking for the best fares to Sydney(AU), off-season travel or off-peak hours, or mid-week flights are all good options to lower your airline ticket fares. Consider also flying to other international airports in Australia : Cape York, Albury, Adelaide, Armidale, Alice Springs, Aurukun Mission, Avalon, Ayers Rock, Barcaldine, Bundaberg, Badu Island, Bedourie, Broken Hill, Bathurst(AU), Blackall, Blackwater, Broome, Brampton Island, Brisbane, Ballina, Borroloola, Boulia, Bourke, Bathurst Island, Burketown, Birdsville, Brewarrina, Burnie, Cobar, Canberra, Ceduna, Coffs Harbour, Croker Island, Cunnamulla, Coonamble, Coconut Island, Cloncurry, Cairns, Coober Pedy, Casino, Charleville, Cooktown, Coen, Cleve, Carnarvon, Cowra, Dubbo, Daydream Island, Mudgee, Dunk Island, Doomadgee Mission, Denham, Devonport, Derby, Darwin, Edward River, Elcho Island, Emerald, Esperance, Fitzroy Crossing, Goulburn Island, Geraldton, Griffith, Grafton, Boigu Island, Glen Innes, Gladstone, Nhulunbuy, Garden Point, Groote Eylandt, Whitsunday Kontiki Resort, Hobart, Halls Creek, Hughenden, Hayman Island, Hookers Creek, Hamilton Island, Hervey Bay, Lockhart Rivers, Mount Isa, Inverell, Julia Creek, Shute Harbour, Kalbarri, Kingscote, King Island, Katherine, Kubin Island, Kowanyama, Lindeman Island, Lord Howe Island, Learmouth, Leinster, Lightning Ridge, Leonora, Longreach, Launceston, Lismore, Laverton, Lizard Island, Maryborough, McArthur River, Maroochydore, Melbourne(AU), Mount Gambier, Millingimbi, Mount Hotham, Merimbula, Monkey Mia, Meekatharra, Mackay, Mount Magnet, Maningrida, Moranbah, Mildura, Moree, Moruya, Murray Islands, Narrabri, Darnley Island, Norfolk Island(AU), Newcastle(AU), Normanton, Numbulwar, Nyngan, Orange, Yorke Islands, Olympic Dam, Mornington Island, Gold Coast, Cooma, Paraburdoo, Perth, Port Hedland, Parkes, Port Lincoln, Proserpine, Port Macquarie, Portland(AU), Port Augusta, Ramingining, Richmond(AU), Roma, Rockhampton, Ngukurr, St George, Snake Bay, South Molle Island, Sue Island, Tennant Creek, Traralgon, Thangool/Biloela, Thursday Island, Tamworth, Tom Price, Taree, Townsville, Toowoomba, Mabuiag Island, Quilpie, Woomera, Useless Loop, Victoria River Downs, Warraber Island, Weipa, Wagga Wagga, Walgett, Winton, Warramboor/Mt. Keith, Windorah Park, Wudinna, Wiluna, Whyalla, Wyndham, Christmas Island(AU), Yam Island, Thargomindah, Newman. Mobissimo is also available on Facebook , Twitter, Google+ and other social networks. Read our Travel Blog to find fantastic flights deals to Sydney(AU).